Wisdom Renaissance: How to Embrace the Conceptual Age? Unite the Left Brain with the Right! Aesthetic design... Story-telling... Harmony-in-concert... Cultivation-of-empathy... Team-playing... Finding-meaning... This is where the future is being conceived right now and it no longer automatically belongs to people and organisations that have been successful in the past. Moving forwards, it belongs to different kinds of personalities with different kinds of mind-sets. Today -- amid the uncertainties of national economies that have gone from boom to bust to near flat-lining or negative GDP growth -- there's a metaphor that explains what is going on and its right inside our heads. The triumphant London Olympics and Paralympics have shown not just the population of the United Kingdom but billions around the world what can be achieved through the combination of left-brain and right-brain activity including the amplification of the grand narrative via aesthetic design, story-telling, harmony-in-concert, cultivation-of-empathy, team-playing and finding meaning and purpose in our ordinary lives rendered extraordinary by coming together as one. Unite the Left Brain with the Right! Having gone beyond the Agricultural and Industrial Age, the global and local economy is now moving through the Information Age to the Conceptual age. Powered by armies of industrial and knowledge workers, the sequential combination of the Industrial Age and Information Age has delivered a standard of living that would have been unimaginable at the time of our great grandparents and the generations before them. Their lives were defined by scarcity: Ours are shaped increasingly by abundance. However the Information Age is shuddering to a close now and giving way to the paradigm shift of the Conceptual Age which demands balanced, conscious, creative and inspired leadership that rises above the self and creates a climate for perpetual innovation and invention. 6. Finding-meaning to identify a sense of purpose and significance that gives consequence to the ordinary lives of extraordinary people. Each of these “Concepts” are high touch, uniquely human abilities, that in the past "Ages" have not been as much in demand as they are now proving to be. Why? These "Concepts" are essentially right-brain skills necessary to develop the whole new mind-set this new unfolding era demands. 6. Looks at parts vs Looks at wholes. Beneath the nervous cacophony of our concluding "Information Age" stirs a slow and silent seismic shift. Rising in its place is the Conceptual Age, an era in which mastery of abilities -- that the establishment has often overlooked and undervalued -- marks the balancing point between who rises to the top and who falls to the bottom. 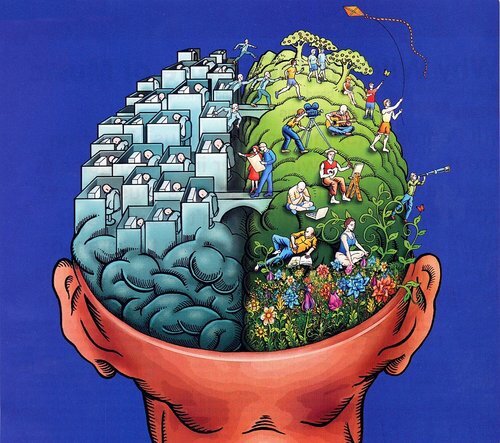 Many of us have a distinct preference for one of the two styles of thinking. Some, however, are more whole-brained and equally adept at both modes. In general, schools, universities and other organisations and institutions tend to favour left-brain modes of thinking, while downplaying the right-brain ones. Left-brain scholastic subjects focus on logical thinking, analysis, and accuracy. Right-brained subjects, on the other hand, focus on aesthetics, feeling, and creativity. The Conceptual Age is essentially about combining the two halves into one!